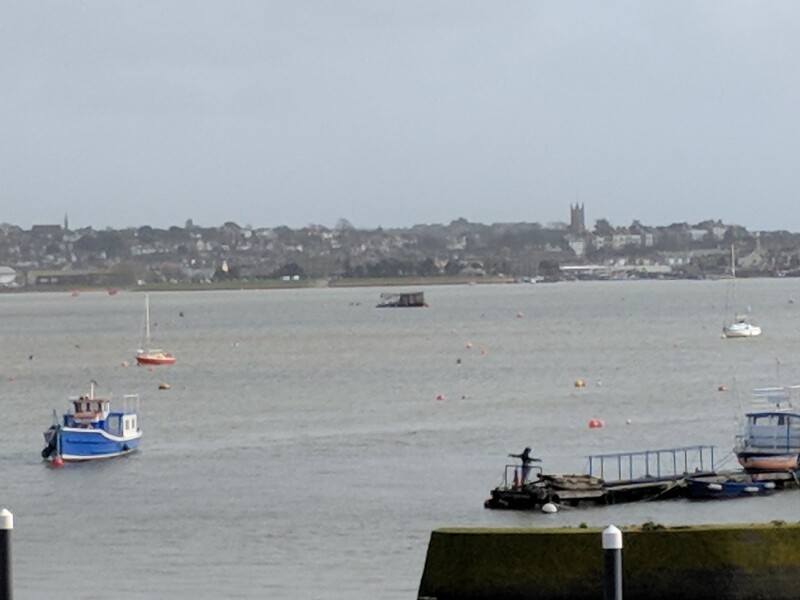 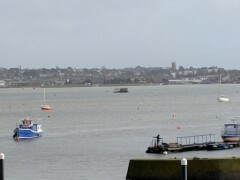 The view across the water to Exmouth from the platform at Starcross station. 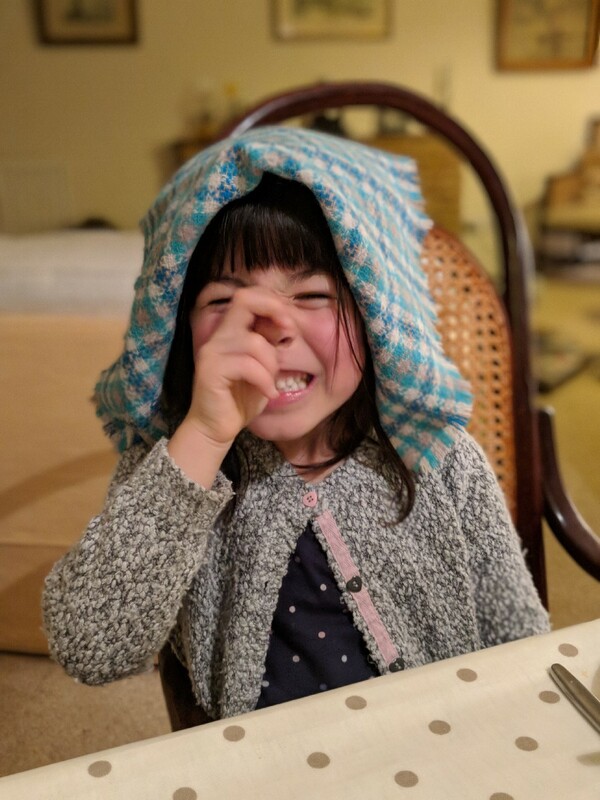 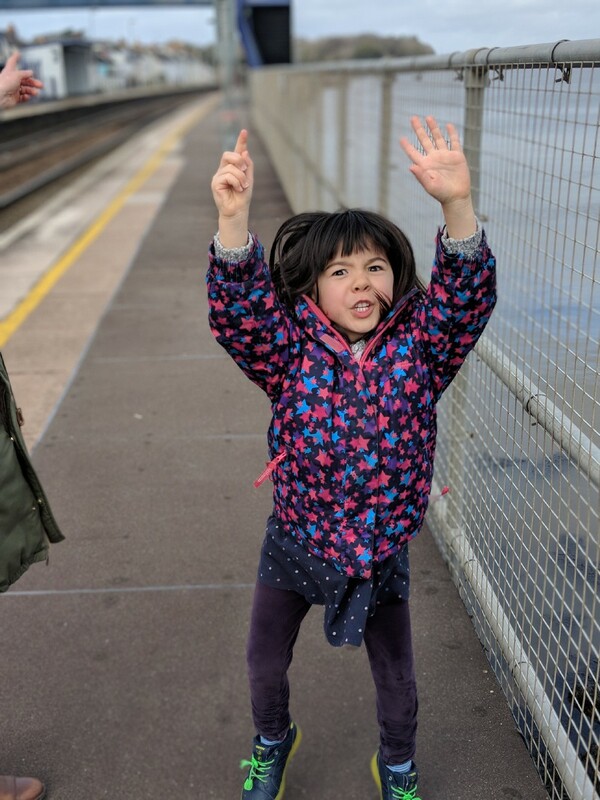 I was trying to show Erika where the Exe River Cafe is. 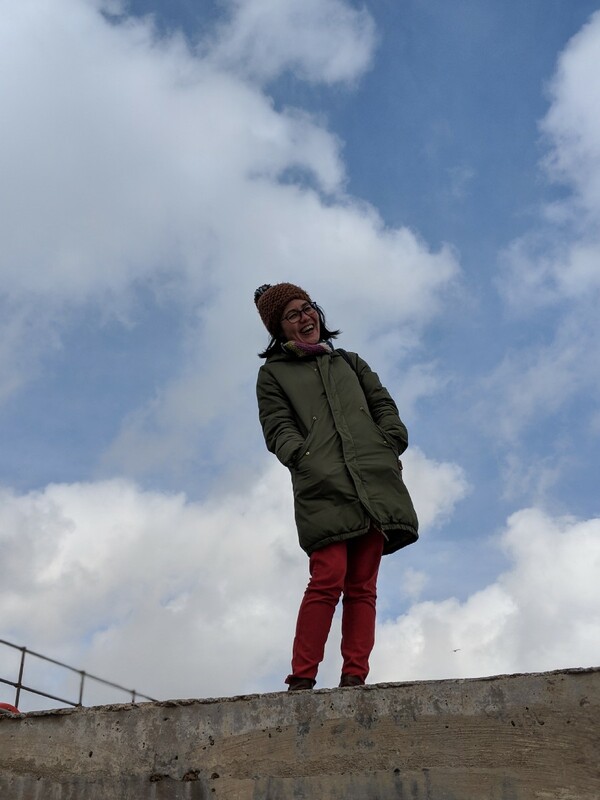 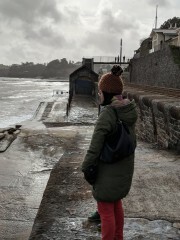 Erika on the platform at Starcross, waiting for the train to Dawlish. 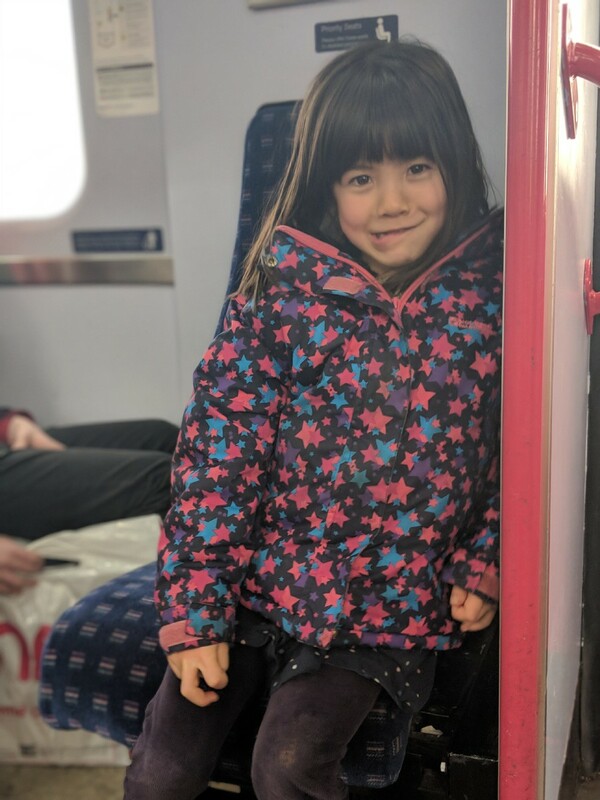 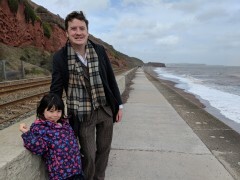 Erika on the train to Dawlish. 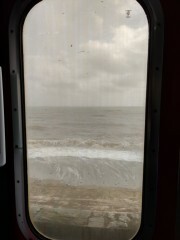 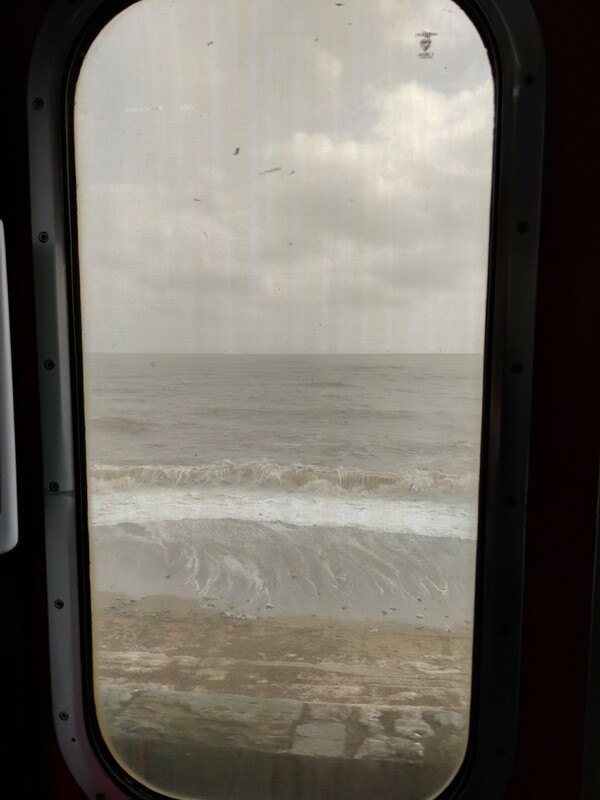 I've always loved the way on this section of the line you can look out of the window and feel like you're on a boat. 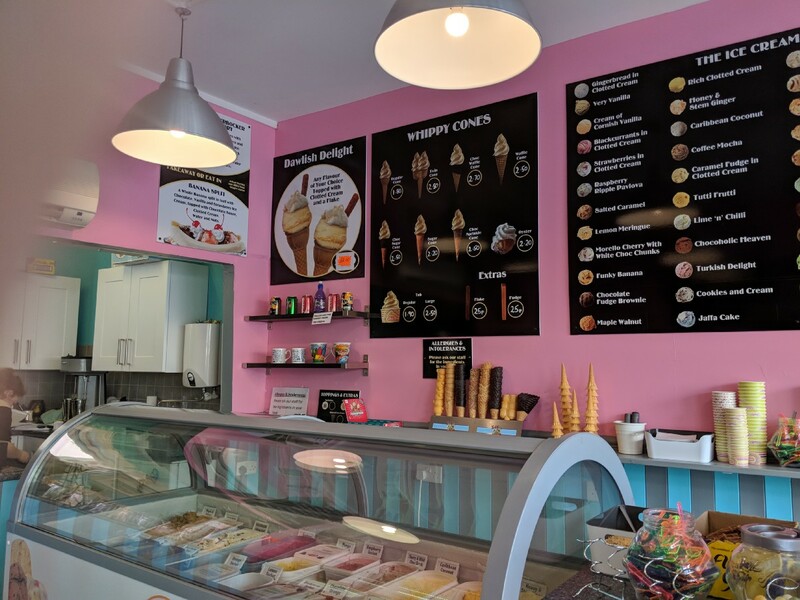 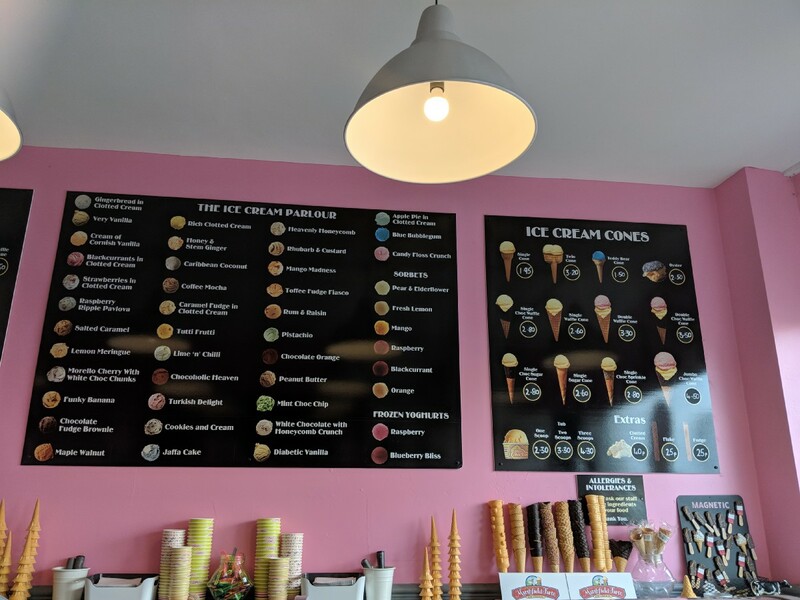 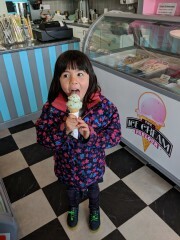 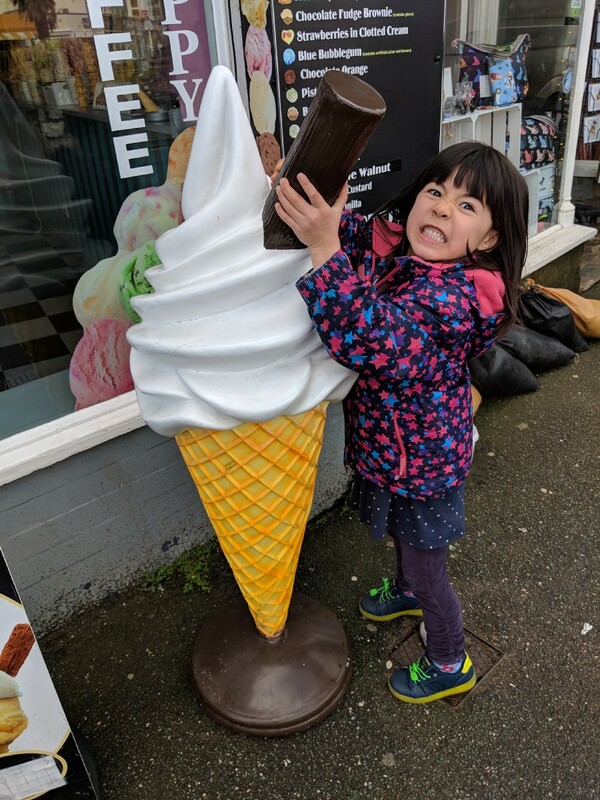 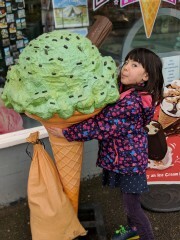 Erika having a mint choc chip in the ice cream parlour in Dawlish. 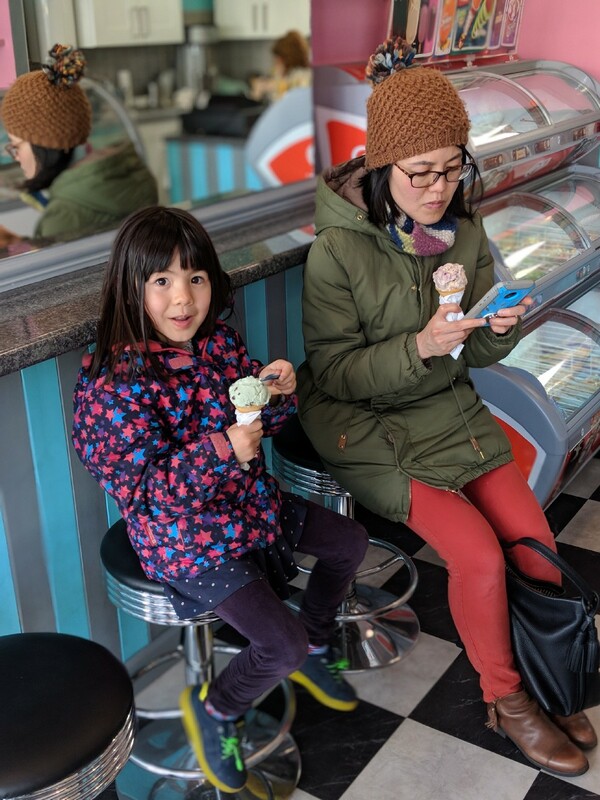 Chie and Erika with their ice cream. Some pictures of the menu for future reference. 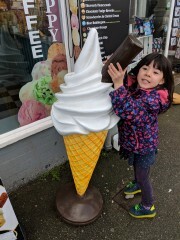 Erika with the giant mint choc chip ice cream outside. 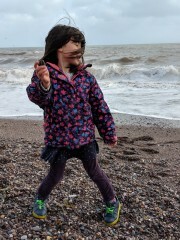 Erika looking a bit scary here! 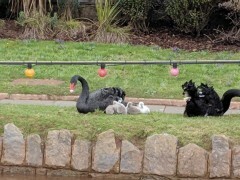 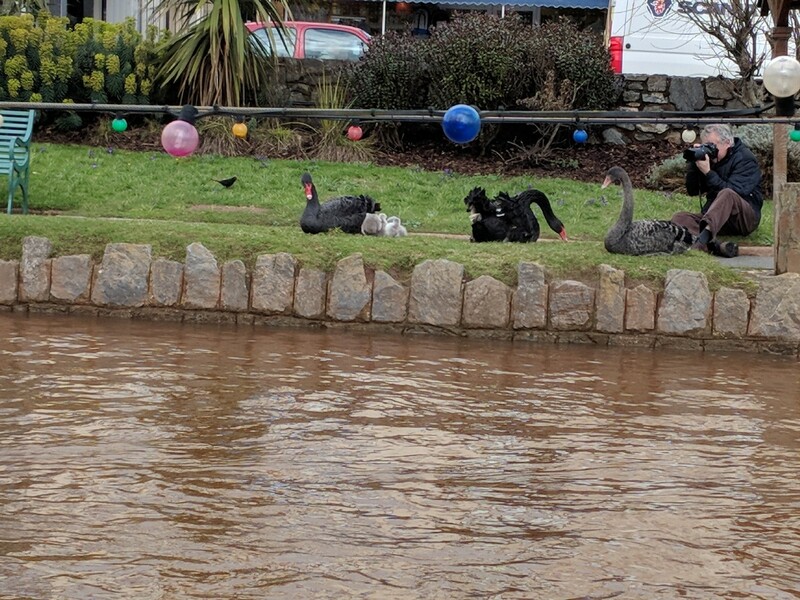 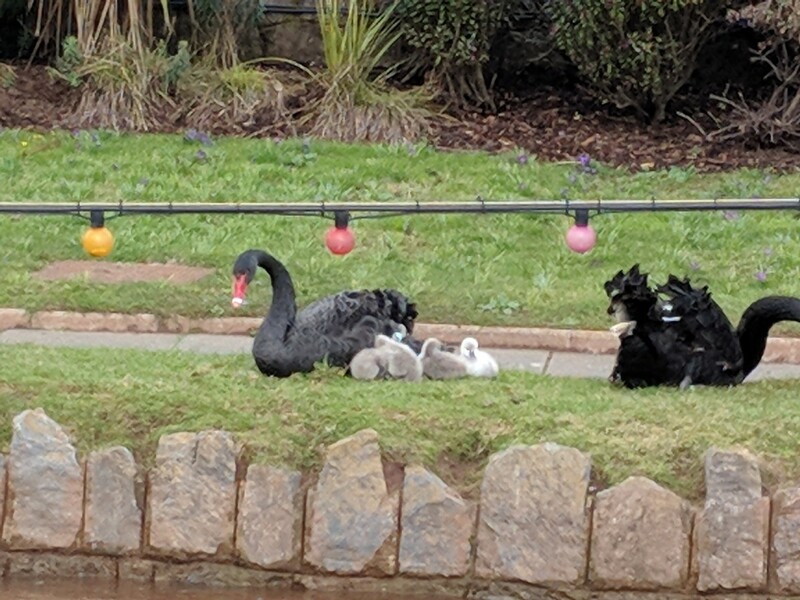 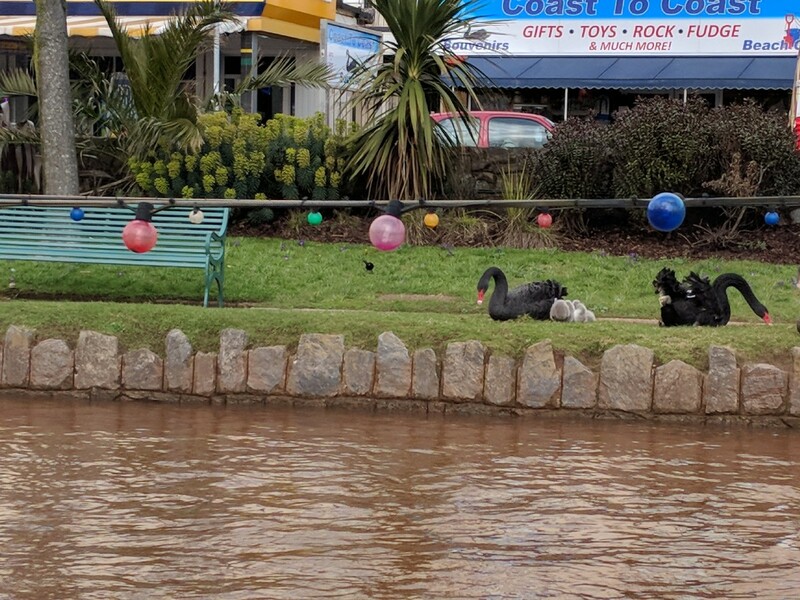 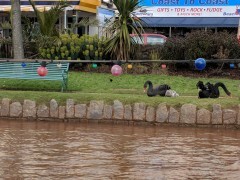 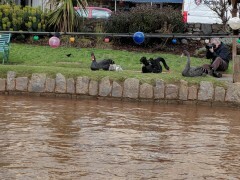 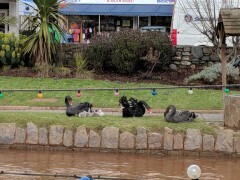 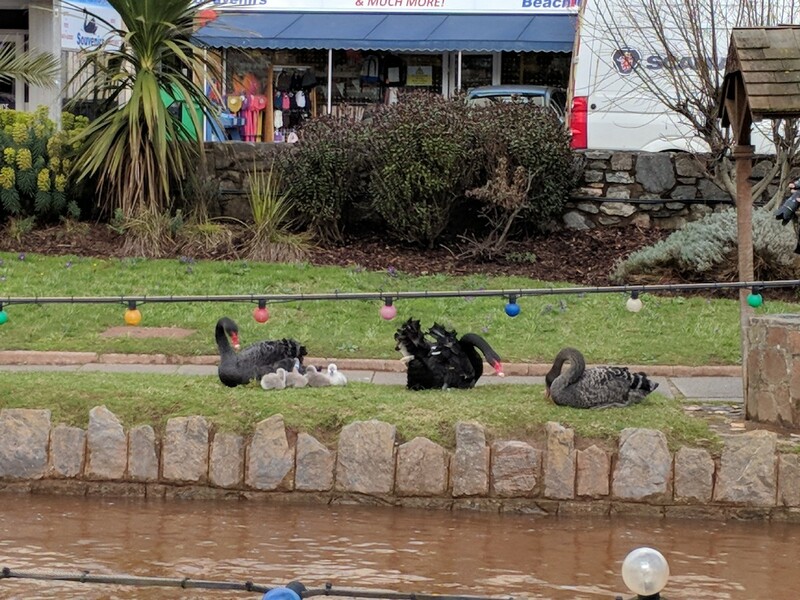 Dawlish's famous black swans with their cygnets. 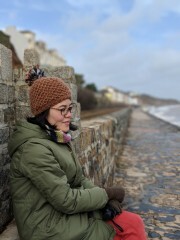 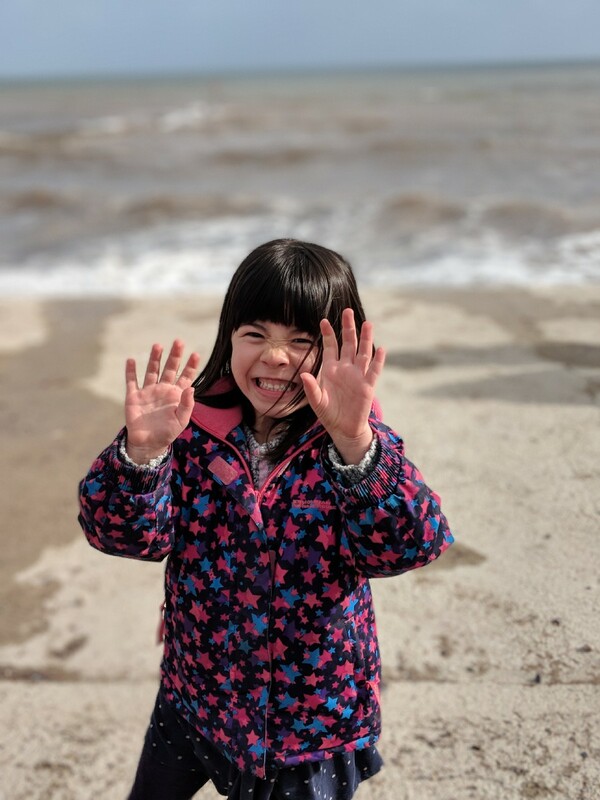 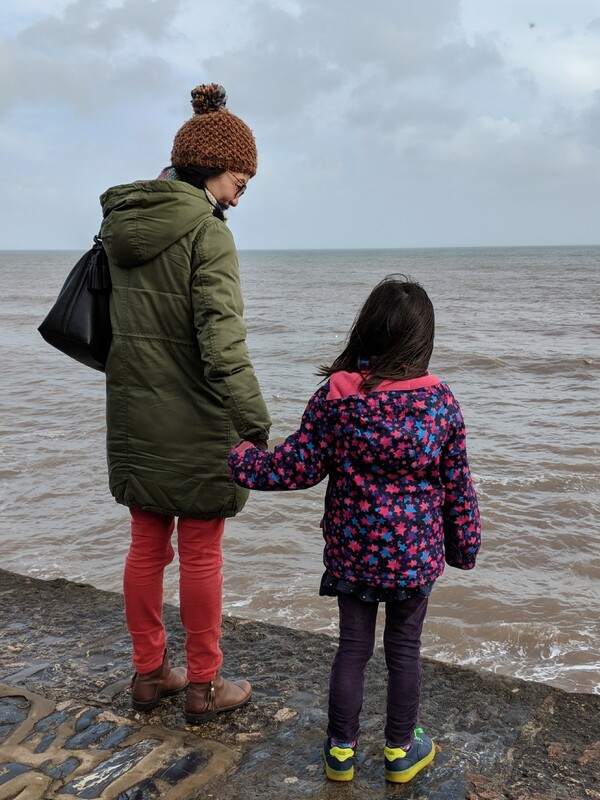 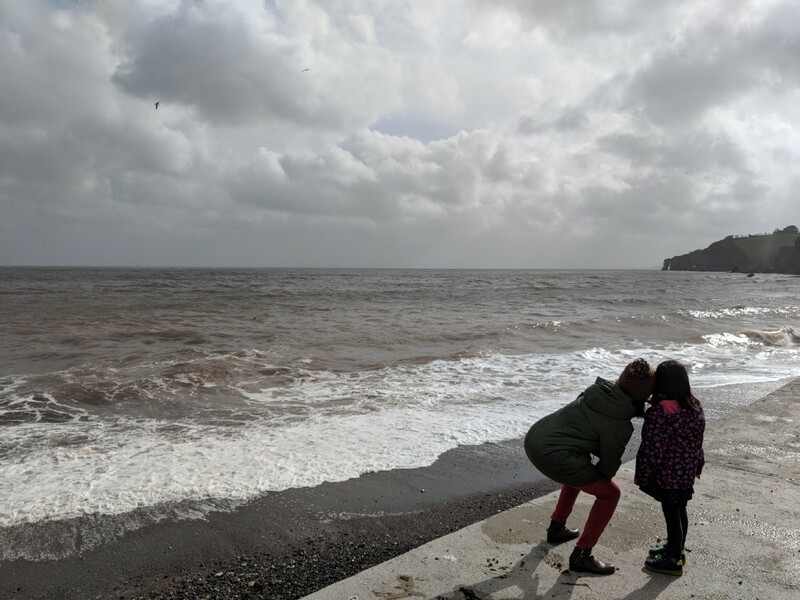 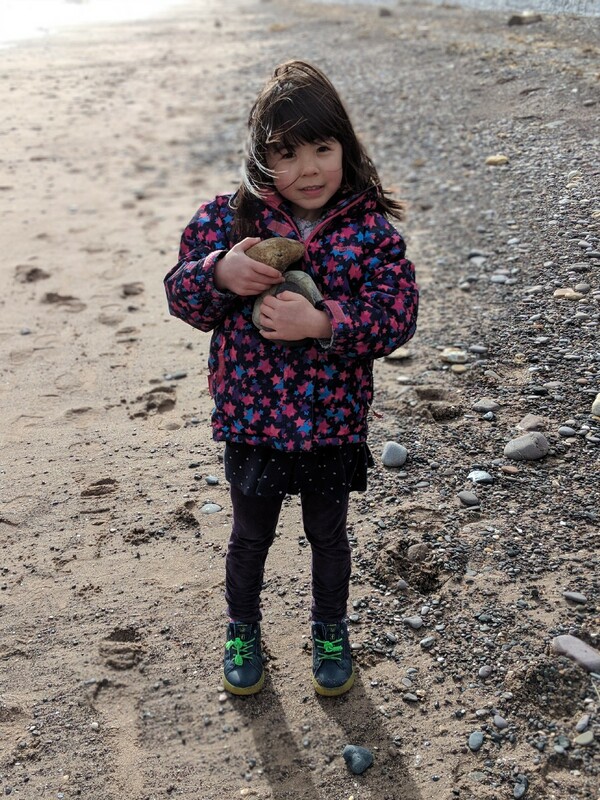 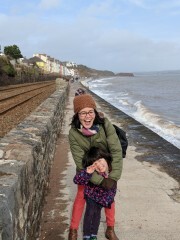 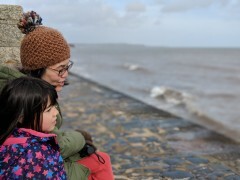 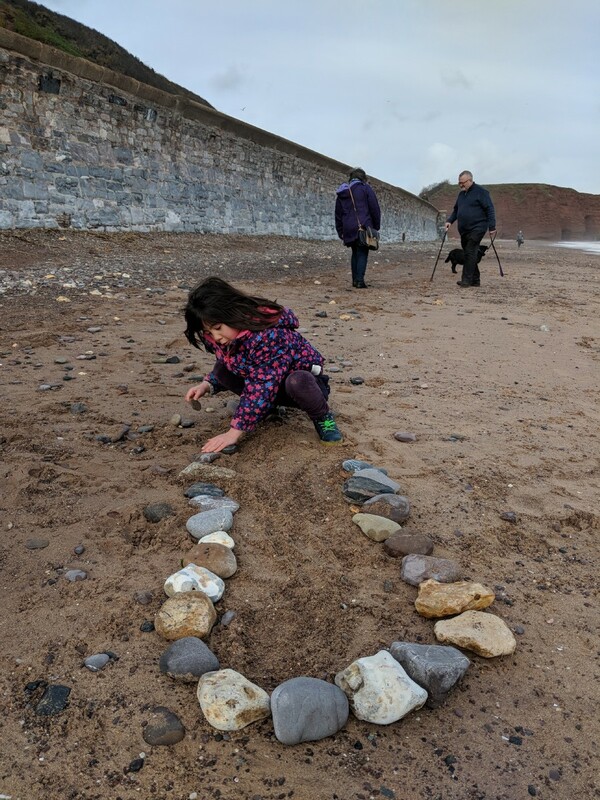 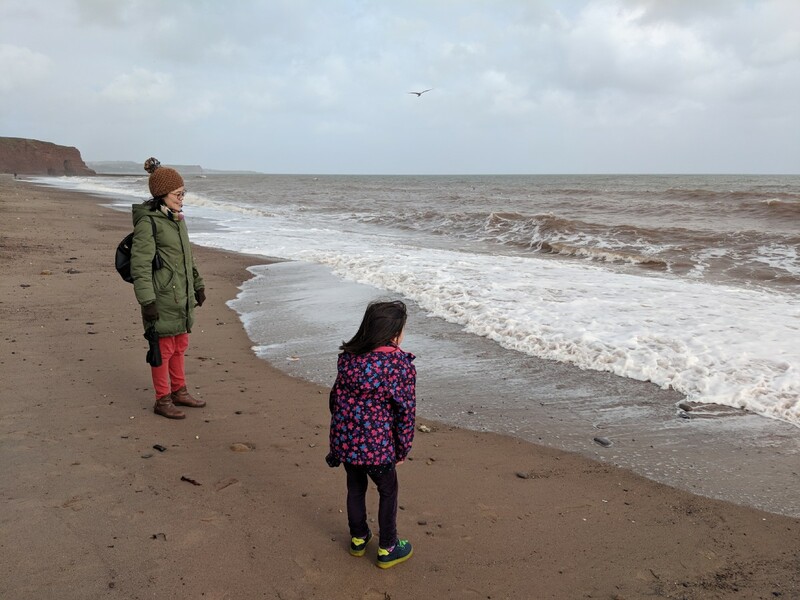 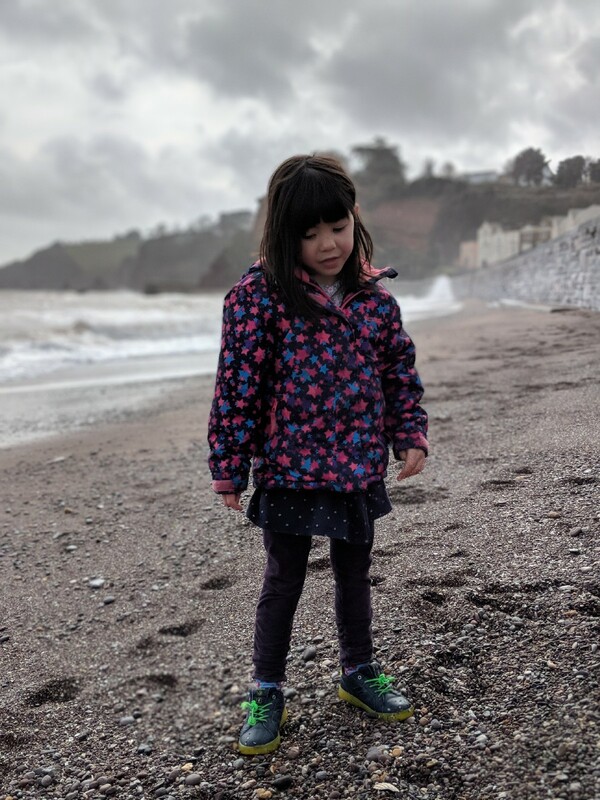 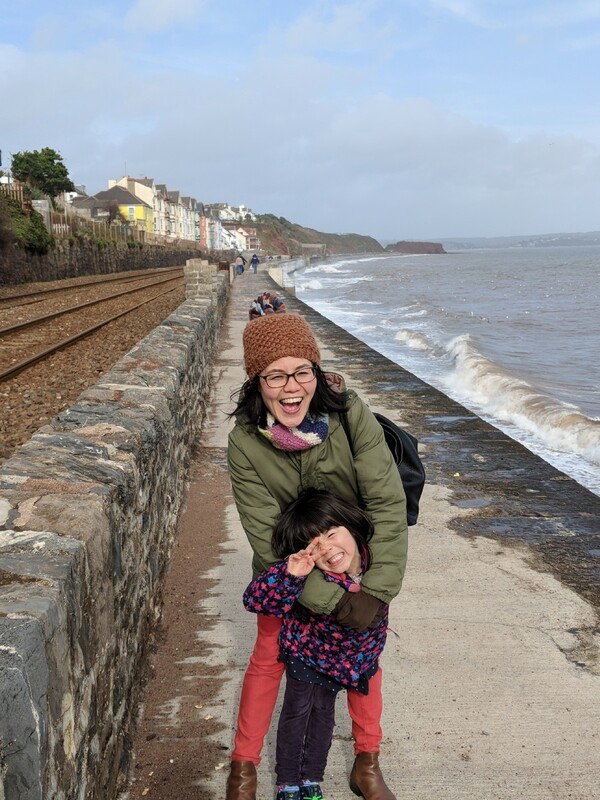 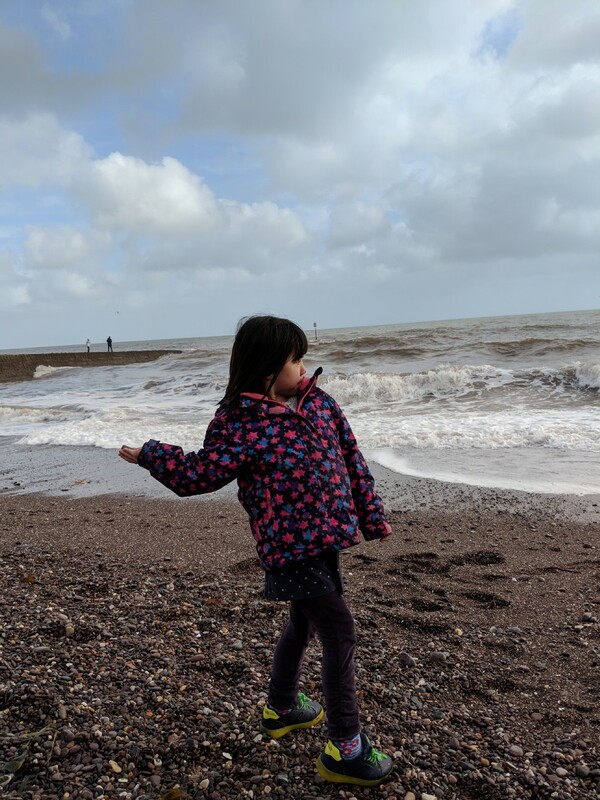 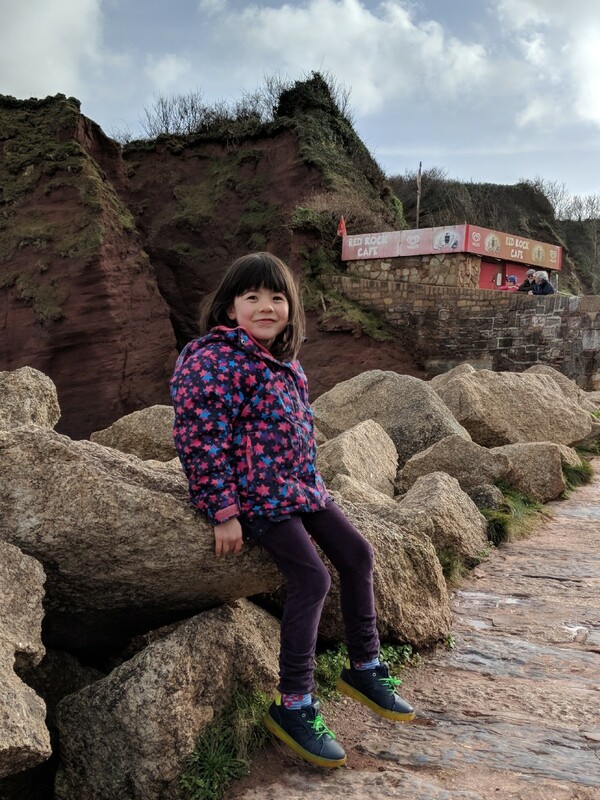 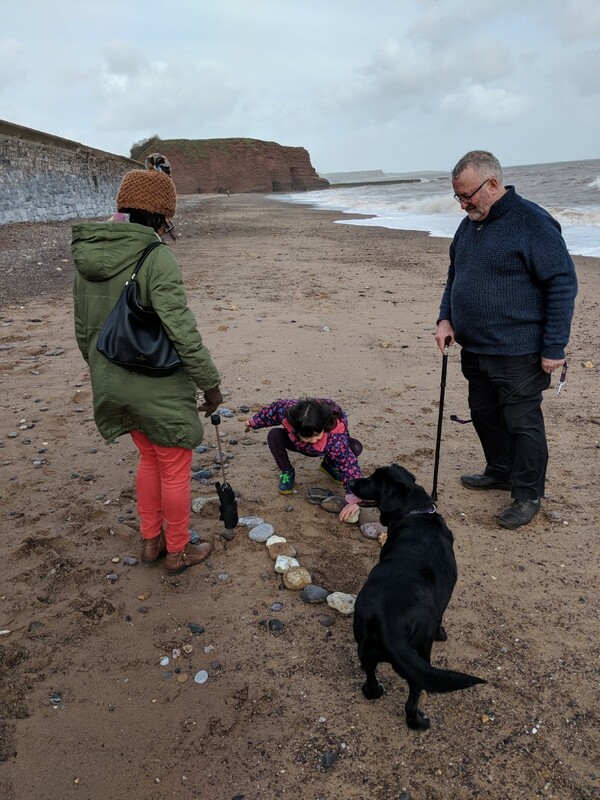 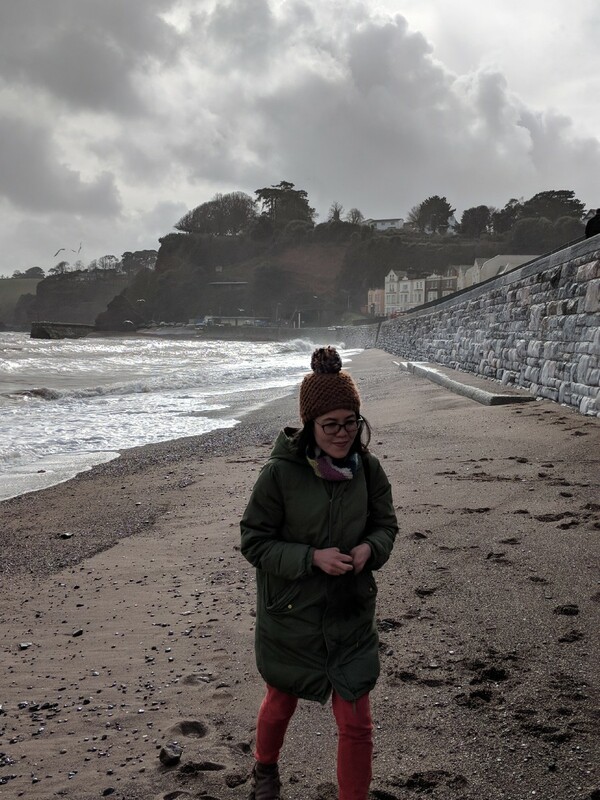 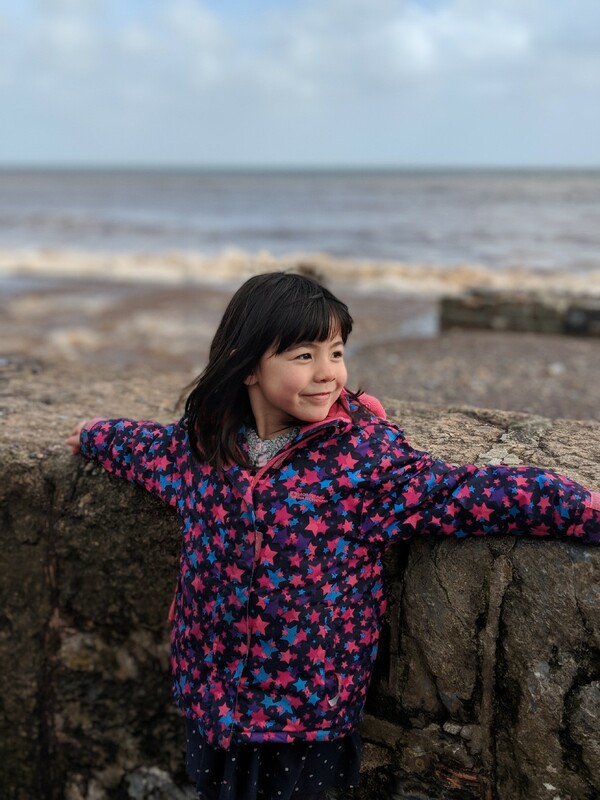 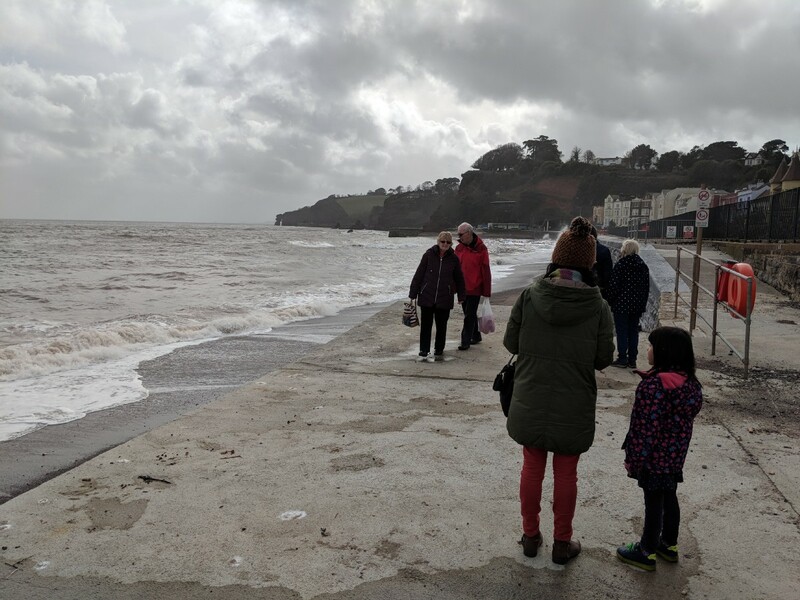 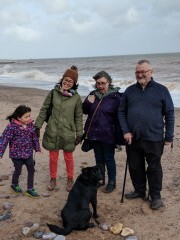 Erika by the beach at Dawlish. The sea was quite rough today. 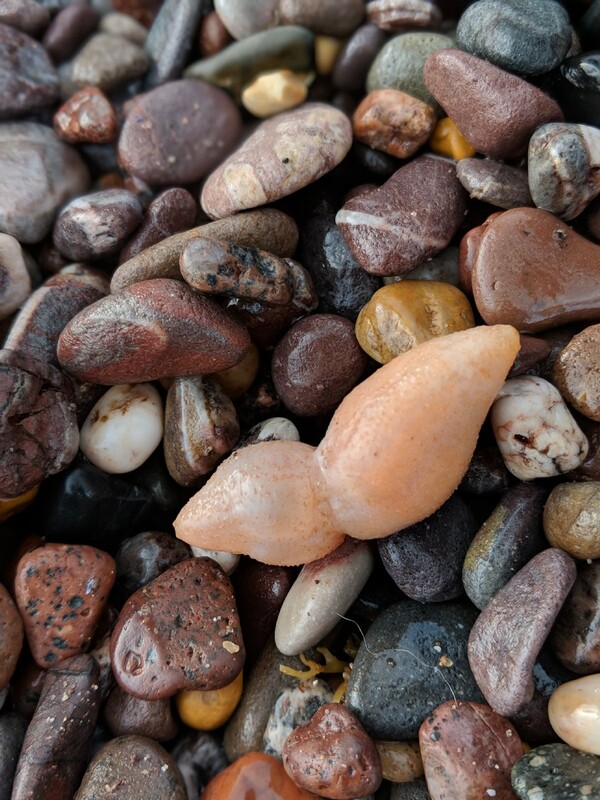 Found this oddity among the pebbles - apparently part of seaweed. 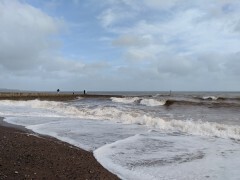 More waves crashing on the beach. Along a stone jetty where some seagulls had gathered. 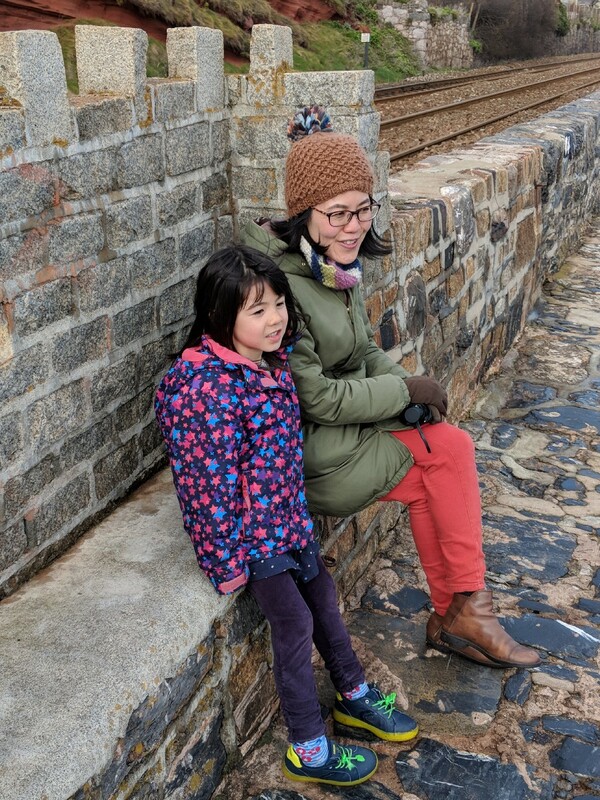 Chie and Erika taking a quick rest along the sea wall. 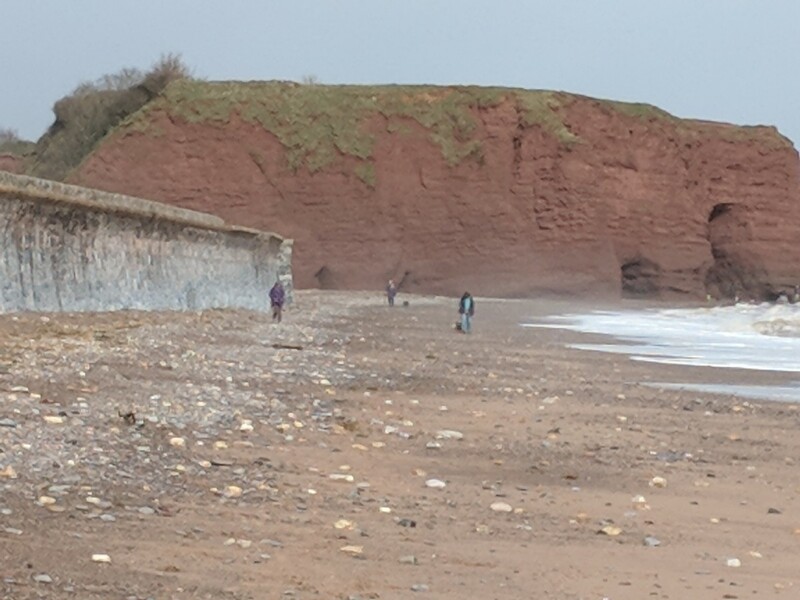 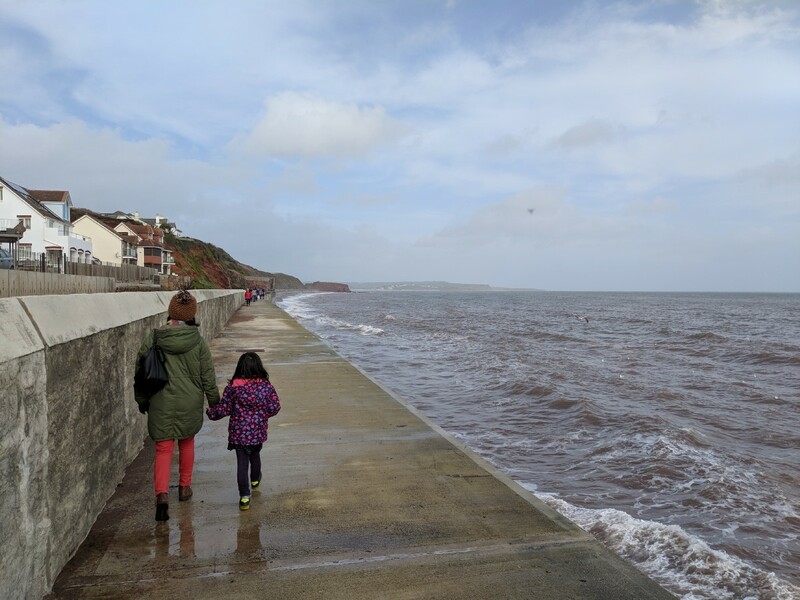 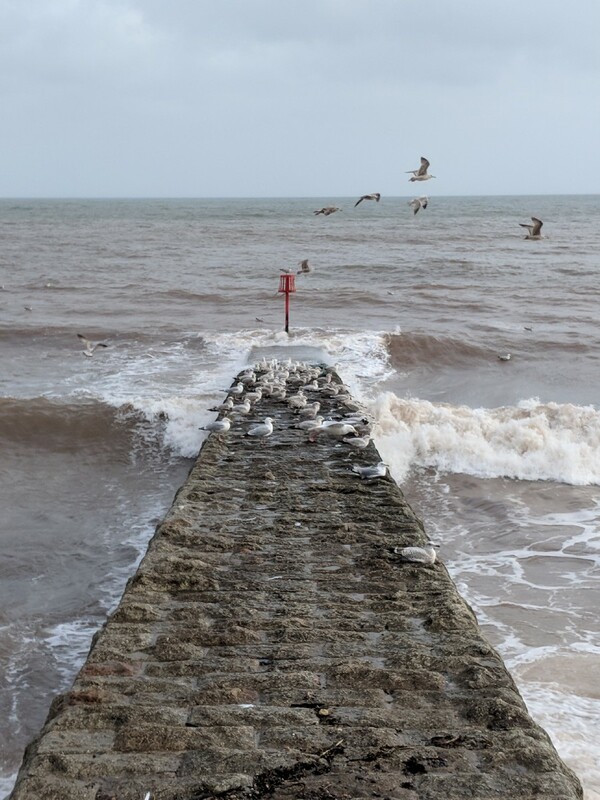 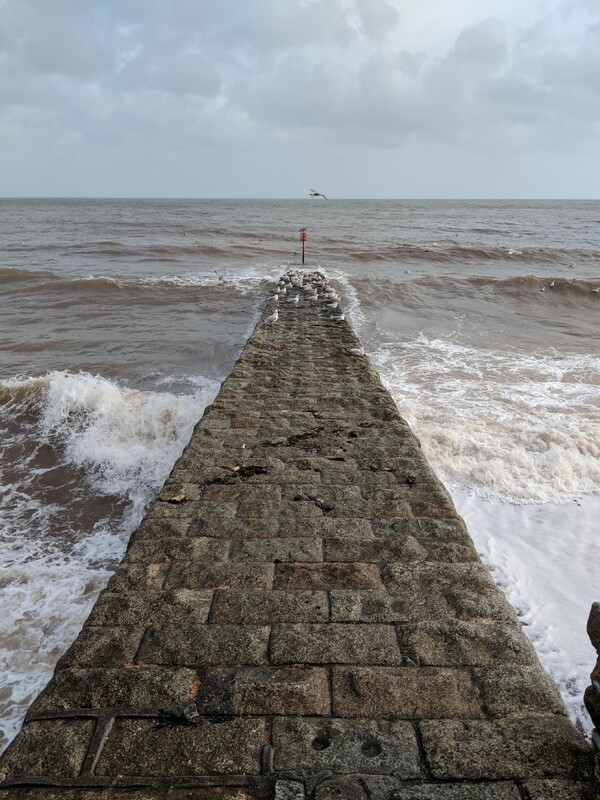 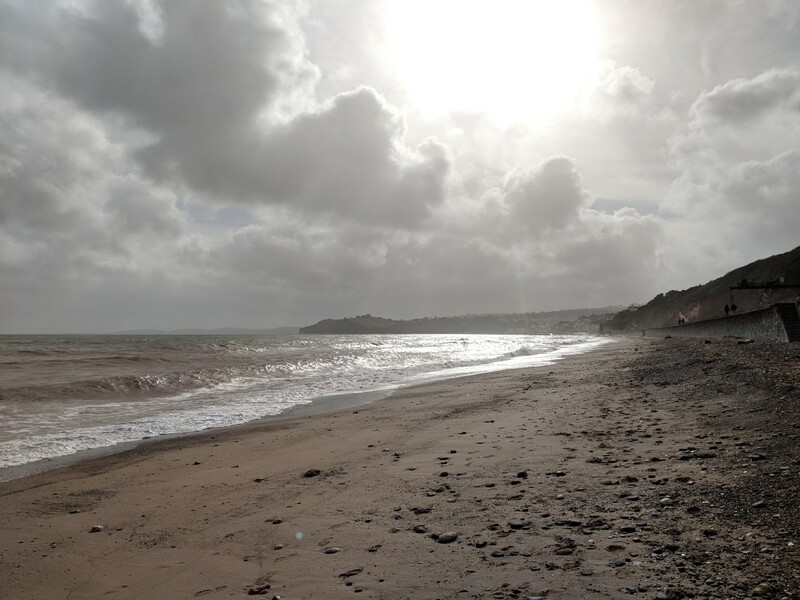 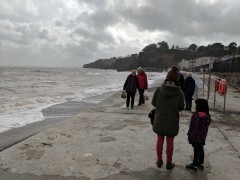 Now walking along the sea wall to Dawlish Warren. 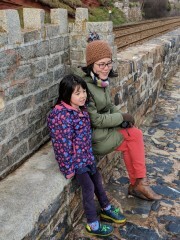 Me and Erika on the sea wall. 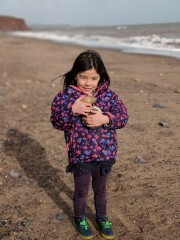 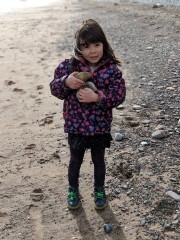 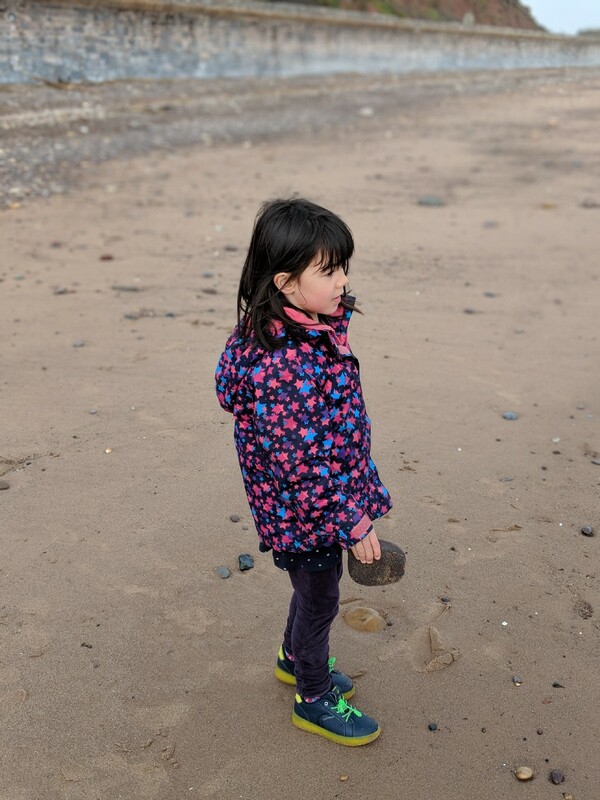 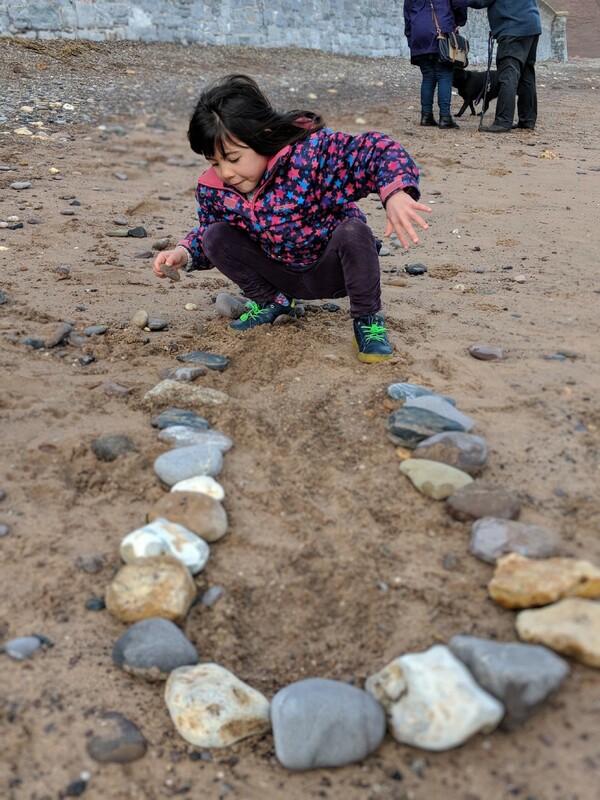 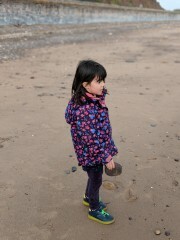 Erika on the beach at Dawlish Warren. 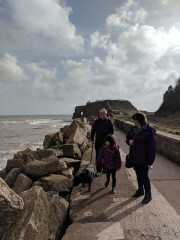 Spotted Grandad, Janie and Jess in the distance! Quite dramatic skies I thought. Erika made a sort of nest for Jess. 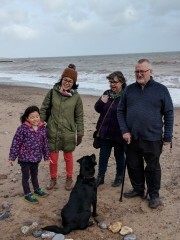 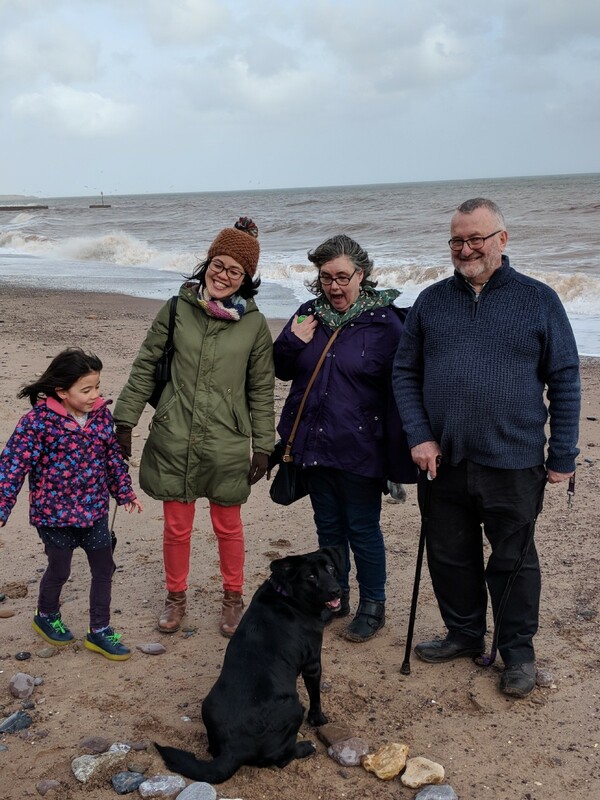 Group shot on the beach. 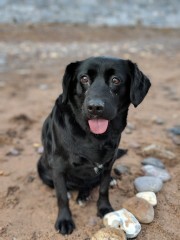 Jess the dog on the beach. Quite pleased with that. Erika near the Red Rock Cafe. Towards the end of our walk along the sea wall now. 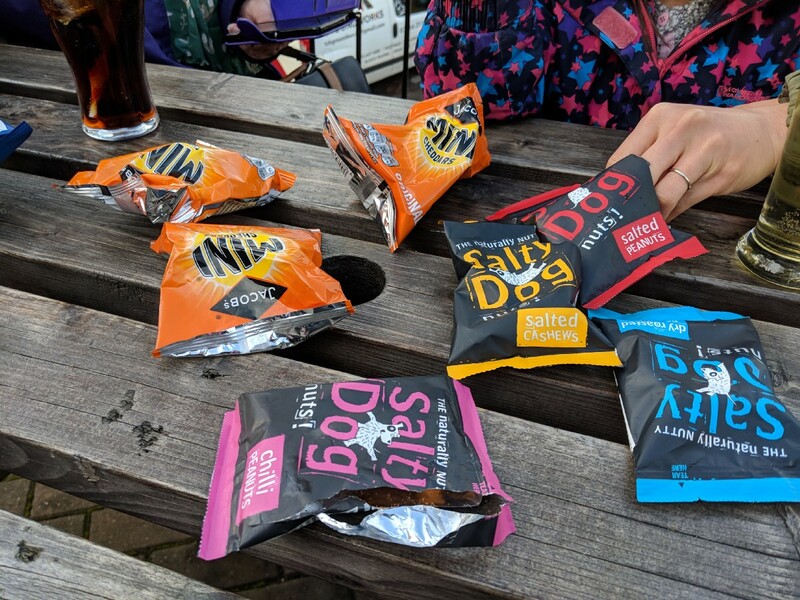 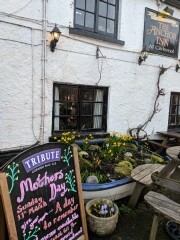 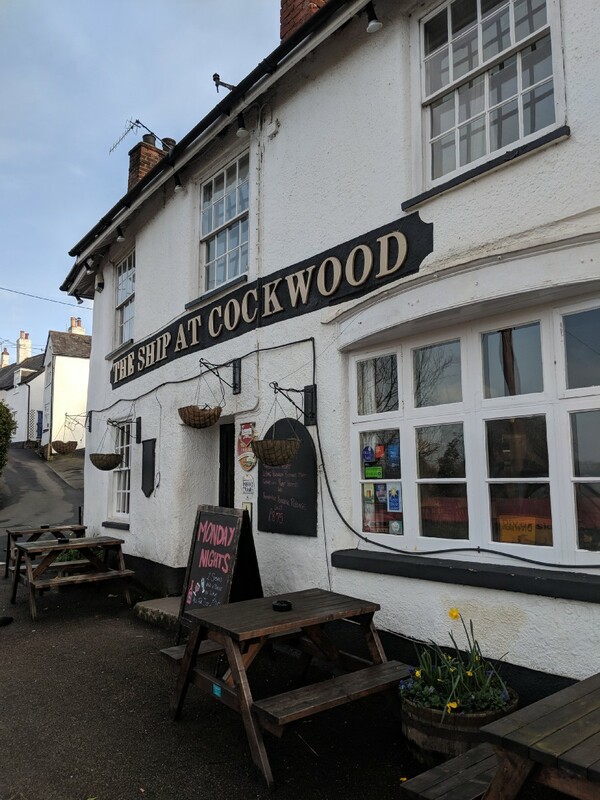 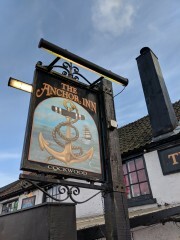 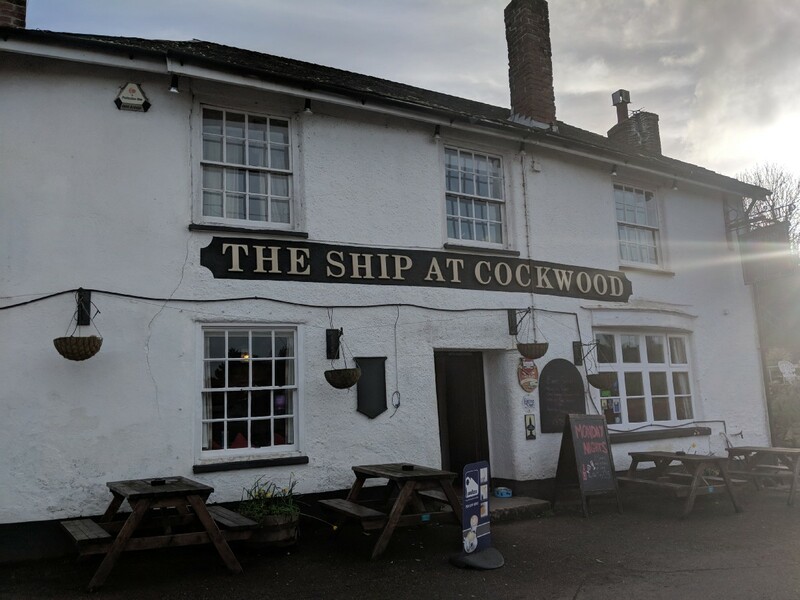 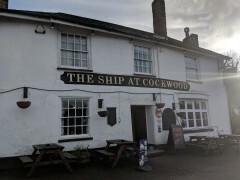 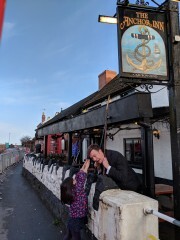 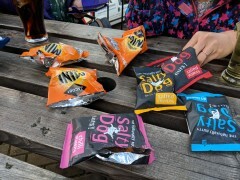 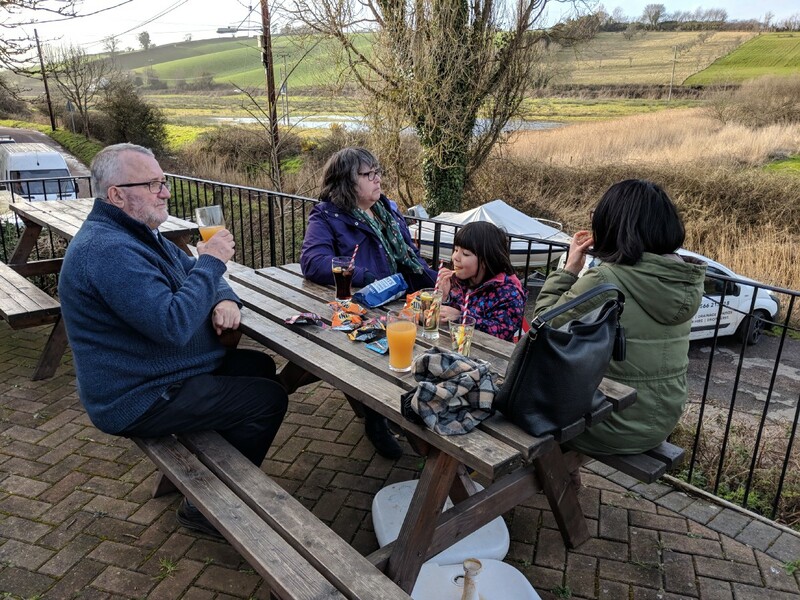 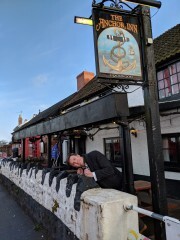 Now having a drink at the Ship Inn at Cockwood. 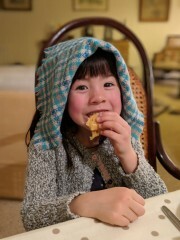 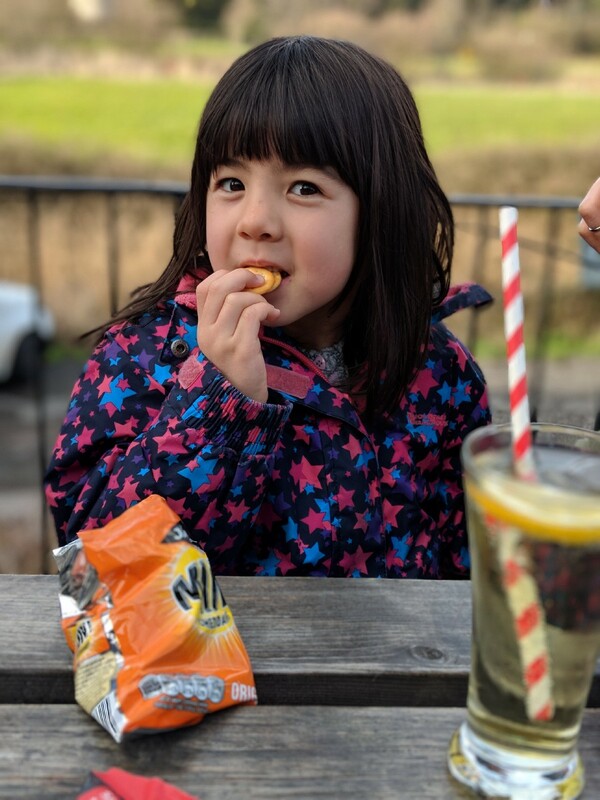 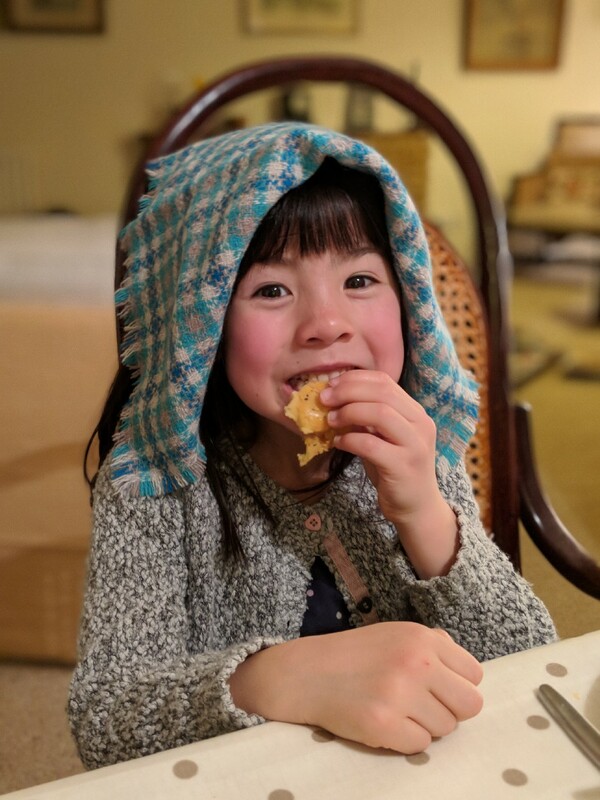 Erika with some cheesey biscuits as she calls them. 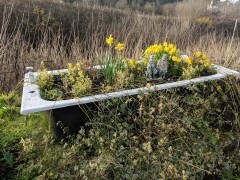 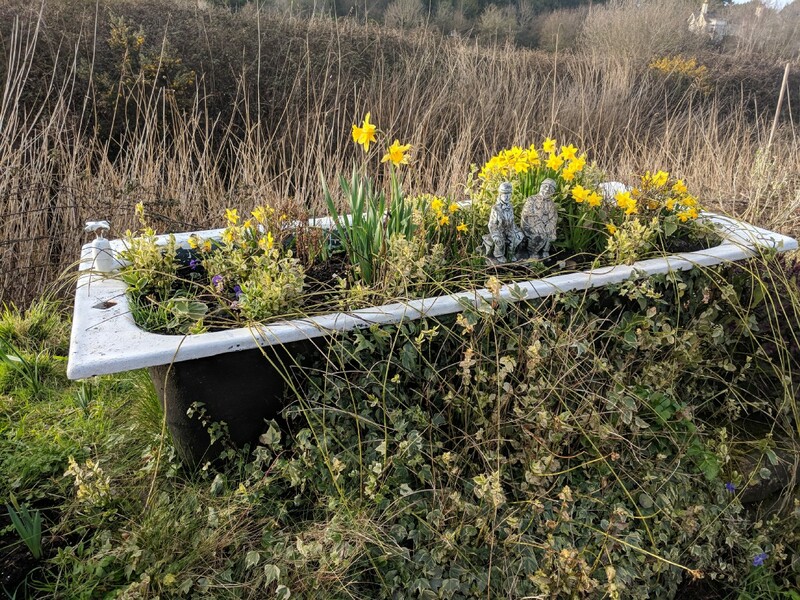 A nice spring floral display in a bath tub. 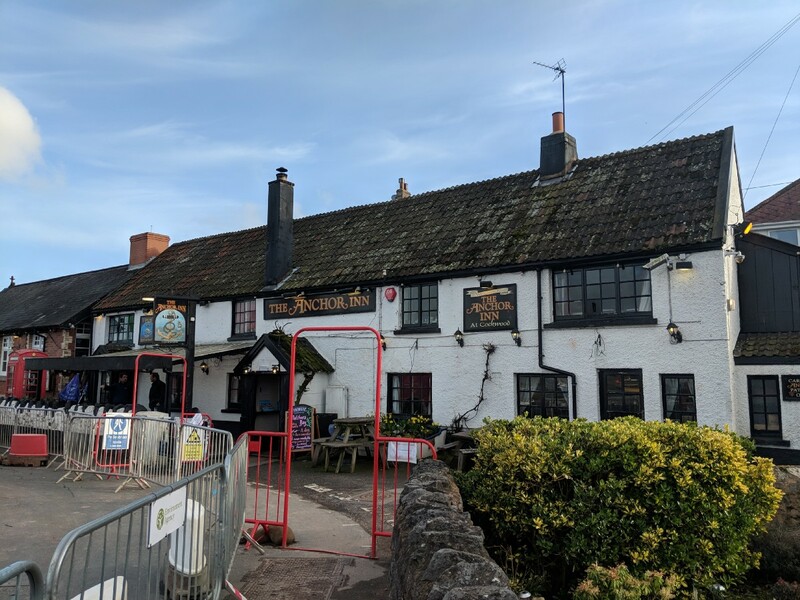 The Anchor Inn, not at its most photogenic currently due to the construction work in Cockwood harbour. Me re-enacting a scene from my childhood when I got my head stuck in the railings here (the railing since removed). Erika helping out by introducing railings. 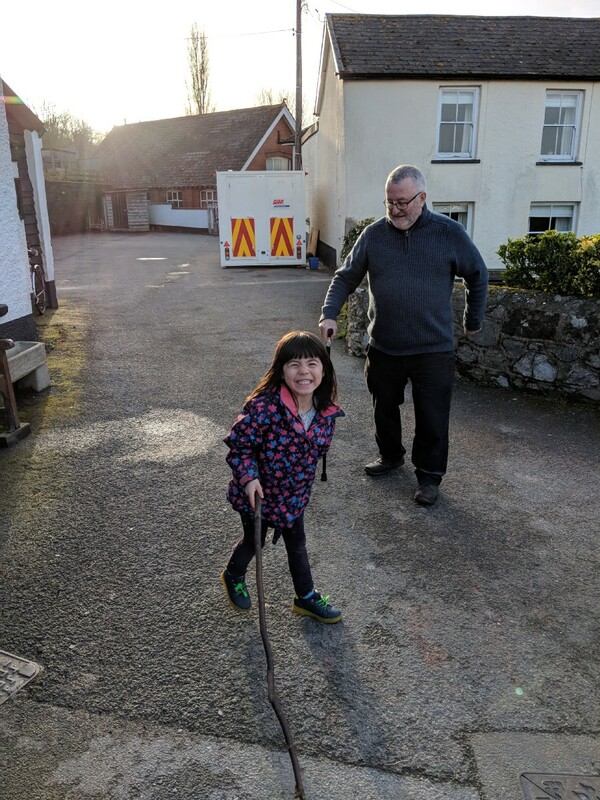 Erika and Grandad doing a bit of Morris dancing in the pub car park. 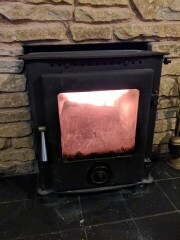 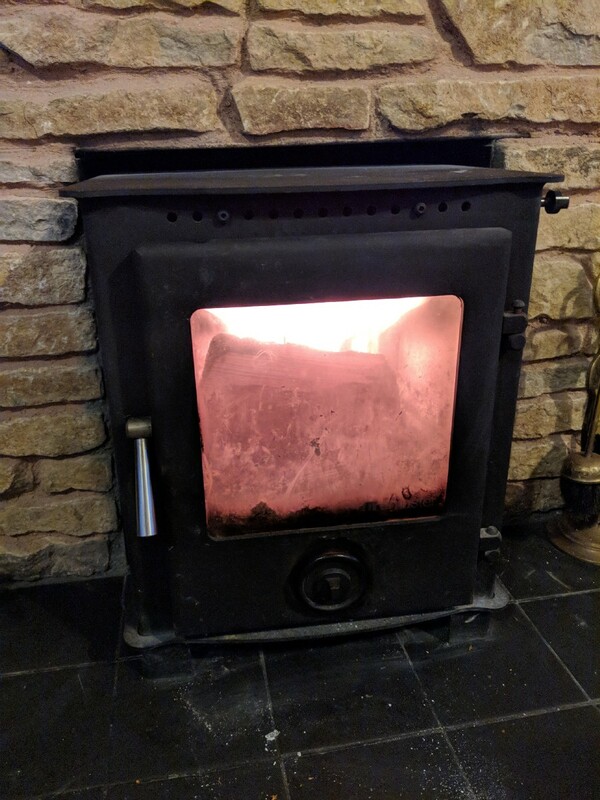 Back at Grandad's house, I made a fire.